The OU-PSD finished collecting signatures under the commitment to sign the coalition agreement with the BYUT. 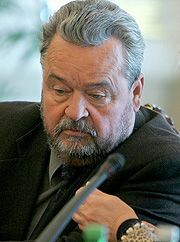 Ivan Plyushch, Igor Kril and Vassyl Petyovka did not put their signatures. The Our Ukraine – People’s Self Defence Bloc finished the collecting signatures under commitment to enter to the structure of the fraction of the same name and to sign the coalition agreement with the BYUT. The representatives of the bloc disclosed to UNIAN that 69 out of 72 parliament members, elected by the list of the OU-PSD to the Verkhovna Rada of Ukraine of the 6th convocation, signed the commitments. Ivan Plyushch, Igor Kril and Vassyl Petyoika did not put their signatures.